Who will finish their campaign on a high - the Steelers or the Thalaivas? Haryana Steelers take on the Tamil Thalaivas in an Inter-Zone Wildcard match of PKL 2018 at the Netaji Subhash Chandra Bose Indoor Stadium in Kolkata tomorrow, Tuesday at 8 pm IST. The Steelers are coming off a 30-39 loss against the Jaipur Pink Panthers, courtesy, yet another, poor defensive performance. The raiders of the Pink Panthers successfully managed to take 23 points from the Steelers defence, as the Steelers' defence looked out of their elements on the night. The Tamil Thalaivas are also coming off a loss. They lost 24-27 to the Bengal Warriors due to poor defensive performance. The Thalaivas could manage just 6 tackle points on a night when their opposite numbers scored 10. Both the teams, Haryana Steelers and Tamil Thalaivas, have had quite a similar season. Their defence has regularly led their raiders down, and on the rare occasions that their defence has performed were the ones where they have managed to secure the game. 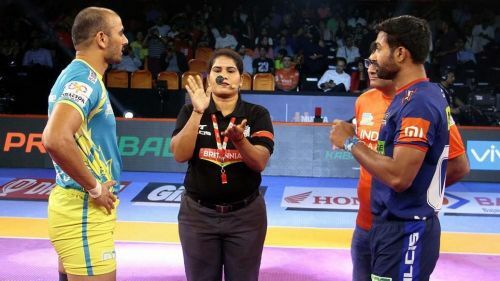 While the Steelers' campaign was severely hampered by the injury to Surender Nada in the initial part of the season, the Thalaivas suffered from a lack of coordination between supremely talented individuals, the likes of Amit Hooda, Manjeet Chillar, Sunil and C.Arun among others. Both the teams stare at a bottom of the table finish and would play for pride in their final encounter of the season. The two teams, Haryana Steelers and Tamil Thalaivas, have faced each other once before in the season, in Match 62, which ended in a 32-32 tie.